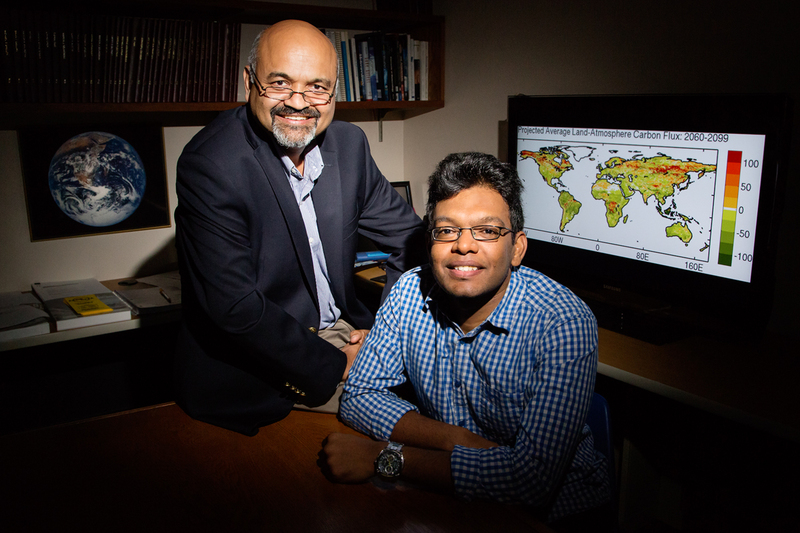 Atmospheric sciences professor Atul Jain and graduate student Prasanth Meiyappan found that most carbon emissions models overestimate the capacity of regrowing forests to take in carbon. Despite a projected abundance of photosynthesis-fueling carbon, nitrogen is limited, thus limiting forests' growth. CHAMPAIGN, Ill. — As carbon emissions continue to rise, scientists project forests will grow faster and larger, due to an increase in atmospheric carbon dioxide, which fuels photosynthesis. But a new study by researchers at the University of Illinois at Urbana-Champaign and the University of Bristol in the United Kingdom finds that these projections are overestimated. By modeling future land cover and land use changes and other factors, the researchers found many forests won’t be able to absorb as much carbon dioxide as projected because they’ll have a shortage in another vital nutrient for plant growth: nitrogen. The paper, published in the journal Global Biogeochemical Cycles, deals specifically with what are called “secondary forests” – places that are regrowing after deforestation, wood harvest and fires. “The carbon that is lost from a forest during harvest or fires can be replaced over time if the forest regrows, so net carbon loss is minimal. If forest regrowth is limited due to a lack of nitrogen, then net carbon emissions are higher,” House said. Another issue compounding nitrogen limitation is the removal of plant matter for burning. The Intergovernmental Panel on Climate Change has projected that bioenergy will be needed to meet an anticipated dramatic increase in the world’s energy consumption while still limiting carbon dioxide emissions. Forest products and residues – the leaves and sticks below the canopy – and an increase in the range of timber-harvested forests will be a large factor in meeting those energy demands. The team found that because most climate models included in the IPCC projections don’t take into account the effect of nitrogen, they underestimate 21st century net carbon emissions in the land sector by at least 90 percent, and by as much as 150 percent. Jain said the panel’s latest report discussed the importance of how the nitrogen and carbon cycles interact, but this is the first study to quantify how that interaction affects emissions as land cover and land use change. "We hope that this study will trigger a discussion on the importance for climate models to consider nitrogen limitation when evaluating the strength of future land carbon uptake, for the next IPCC report,” Meiyappan said. He added that when there are more models, the panel can take an average across them and come up with the most likely and relevant emissions projections. NASA, the National Science Foundation, the Department of Energy and the Leverhulme Foundation supported this work. Editor’s notes: To reach Atul Jain, call (217) 333-2128; email jain1@illinois.edu. To reach Joanna House, call +44 (0) 7986 860 335; email jo.house@bristol.ac.uk. The paper “Increased influence of nitrogen limitation on CO2 emissions from future land use and land-use change” is available online.